The law mandates premises liability. This is especially true since it is related to personal injury cases in which the incident causing the injury may have taken place in an unsafe place and in substandard conditions on someone else’s property. Most of these cases are founded on negligence and in order to be successful with a premises liability case, the person who is injured needs to prove that it was the property owner’s negligence in maintaining the property that caused the injury. This means that the property owner did not utilize reasonable care in maintaining the property. Be aware that…Not because you were injured while on someone’s property is the property owner negligent of anything. Yes, the property may have been in a precarious condition, but that doesn’t involuntarily mean negligence occurred. You have to prove it and that is why you need an attorney. There are two primary components of determining who is at fault. First, the injured person has to prove that the property owner had prior knowledge or should have reasonably known that the property was unsafe and yet failed to take protective measures to fix it. The premises liability attorney also has to consider whether the injured person was also overly careless. In the preliminary investigation, the cause of the accident should be determined, identifying if it was caused by a hazardous and pre-existing condition. The lawyer upon investigating the evidence will be able to tell if the condition could have been prevented and avoided on the part of the property owner. The investigation should also reveal whether or not the injured individual could have anticipated the danger, avoiding obvious danger. To have a strong case, the injured person must prove that the property owner knew of the danger beforehand and neglected to fix it. Be aware that...Negligence means that the unsafe conditions must have been there long enough to give the owner ample time to fix the problem prior to the accident. If your injury occurred on a business property, you could have a premises liability case and be entitled compensation because even for a business owner, the property also must be kept free of danger. This means that the business owner must keep the property free from accumulated ice or snow. The inside of the building must have noticeable “wet floor’ signs. There should be signs put in place to warn of dangerous stairways. 4. Did You Get an Invitation or Not? If you were invited to someone’s property or received authorization to enter the property, you are considered an invitee. You could be a relative, friend or neighbor. In this case, the property owner is obligated to provide reasonable care and you could have grounds for a premises liability case, if you got injured on the property due to the owner’s negligence. Apartment building and office building owners should have secured all access to the building. That is why many of these large buildings have a doorman or security guard at the front door. The tenants in these smaller buildings are accountable for their own safety if a robbery and subsequent injury occurs when the doors were not kept locked by the tenants. If the injured person can show the building owner’s negligence in demonstrating reasonable care to secure the building, then a premises liability case can be filed. Most swimming pool incidents will generally involve unsupervised children. There are city laws and state laws that govern these ordinances and requirements for swimming pools to be fenced in, usually with a locked gate. 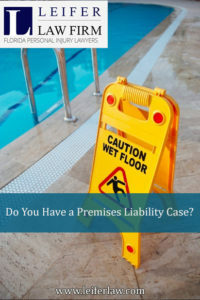 If a person leaves the pool area open and an accident occurs, this could be grounds for a premises liability lawsuit. If you can prove that the other person was negligent, you may not have to prove that you were careless. However, if you can show that you have taken care in an unsafe environment and that the other person is negligent, you can be appropriately compensated. Be aware…No matter how the accident occurred, the injured person wants a fair amount of compensation. Get a liability lawyer to review your case and get the compensation that you deserve. Contact Leifer Law Firm at 561-395-8055 to discuss the details and to know your options for appropriate compensation.